I've started attending a drawing group that meets Wednesdays, and yesterday we started a 6-week pose. This is the first stage of the drawing I'll be developing over the next 6 weeks. 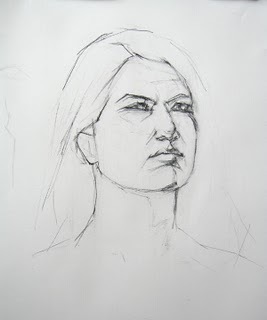 I spent the first session with the techniques I learned at Juliette's workshop last week: concentrating on angles and proportions to make an accurate armature for the drawing. It's not there yet, but I'll be working on it for at least another session or two before I start the "fun part" - adding values. I'll be posting my progress weekly. As for the rest of my art progress.... plans for the studio are moving along. I have found a contractor to build my art shed and building should start next week. I'm hoping to move in by the end of April. In the meantime, I am setting up a temporary studio in our as-yet-unfurnished dining room. But the light is all wrong and it's not a very inspiring space, and I'm still surrounded by boxes. So I'm having a hard time breaking it in. Stumbled across you website, and like your posted drawings. I too am more comfortable with working with the tones and shadows than the actual line drawing part-that being the most difficult by far. I almost like it more when drawings are half finished (like the working drawings of the old masters), thereby showing the quality of line and some tonal work. The quality and feel of your line work is very wonderful. My life is so busy that it has been too long that I have not fit my art into it. Was just looking at classes at my local art institute to jumpstart me when for some reason I clicked on your link. Take care. You write very well too. Thank you for your comment - I've been thinking a lot about what you said about leaving the drawing unfinished in some areas, to show the process. I like that idea. Have fun with the classes! Always good to have the structure and commitment to a class to get you back into working.